Her head is a little wonky, her too skinny limbs twist uncontrollably (trying to keep one foot pointing forward, not backward! ), and when I gave her to little miss for a test run, she quickly took her long ponytails (made of thin strips of felt) and made some of it shorter- requiring a hair cut! 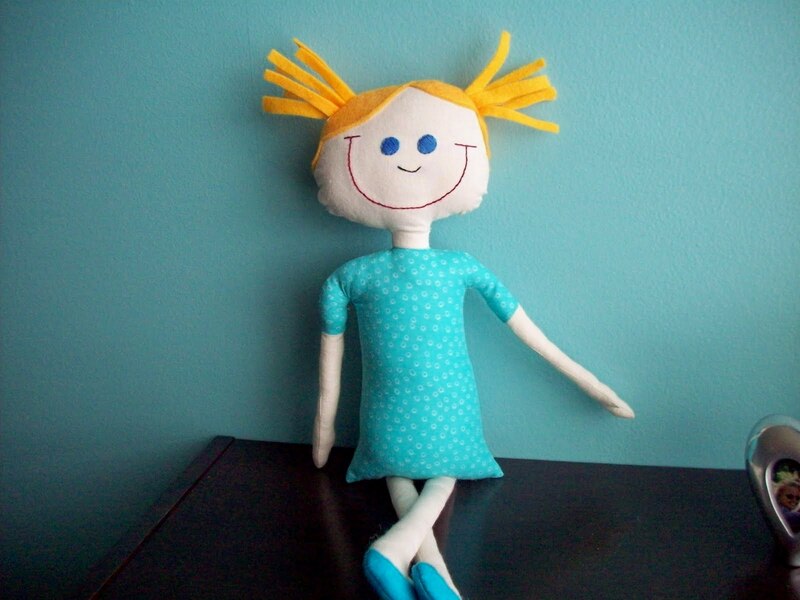 Miss loves her and she'll be fun to wrap up with a matching baby doll quilt as a gift for the big girl! I'll keep working on the pattern though, I think this first run will only last so long (especially the hair). As seen here at jones design company. Linking up to Whatever Goes Wednesday at Someday Crafts! hehe. It DID turn out cute though, even with the too big head and too skinny limbs. Great job. Is she 3 now? The doll turned out really cute! She's adorable, Amy, and I love the name. That smile is outrageously cute!